Alice is now in year one at school and one are that we’ve since a really big improvement in since she started school has been her handwriting. Alice has always held her pen correctly and went to school being able to write her own name. Writing is one of Alice’s favourite things to do and can often be found sat writing lists, stories or asking me for different sentences she can write. 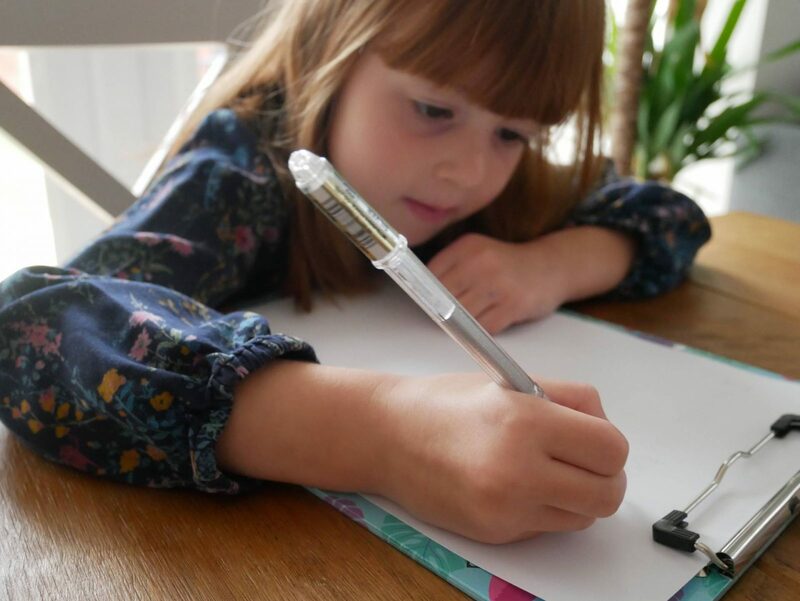 It can be hard as a parent to know how you can support your child with their handwriting, of course it was something we learnt such a long time and kind of taken for granted. I’ve always had a love of writing and I can see that Alice is following in my footsteps and I want to help her in any way I can. Finding the right environment – By getting your child to sit at a desk or a table, they will sit in the correct writing position. Which affects their posture. Poor posture can make handwriting more uncomfortable. The right grip – This is probably one of the key areas to make sure they are getting right. As getting this wrong can affect their handwriting and could possibly be uncomfortable for them. Paper – This might seem a strange one. But I definitely notice a different when Alice uses lined paper, to plain paper. But by having the lines, it helps them with getting the letter size right. Pace – Getting your child to slow down and take their time. When they first learn to write, it’s not a race to finish. By taking their time over their letters, the formation will be better, the size of the letters will be more consistent and there will be fewer mistakes. Making writing fun – It’s important to make it fun for them. You know your child best and what excites them, incorporate this into writing. Play games, write poems, jokes, stories anything that gets them wanting to learn to write. I put some of these tips in place with Alice and when she finished school for the summer holidays, I was keen to keep her interest in writing going and to make it exciting for her. The summer holidays can be a long break and I didn’t want the focus to go and undo all her hard work. I brought Alice a scrapbook, which cost me £2.14 from Amazon for 2, and it was the best thing I did. I explained to Alice that she could write about all the things that we were going to do over the summer holidays, a bit like a diary. She loved the idea from day one and couldn’t wait to get started. We didn’t write in it every day, as I didn’t want it to become a chore and lets be honest not every day was that exciting! But very quickly Alice decided when she felt that she wanted to capture a moment. We would sit together and Alice would let me know what sentence she wanted to say and then she would write it, asking me for help when we needed. We all know that repetition can be the best form of learning and this was definitely the case with the scrapbook. Because a lot of her sentences would start ‘I went’ or I did’ and by the end of the summer she could confidently write the start of her sentences. To add to fun of making a scrapbook, we would save any tickets from places we visited to stick in and we printed out photos and stuck those in too. Such a simple idea, not only gave Alice something fun to do over the summer holidays, but it gave us the chance to focus on her handwriting. She was able to practice her finger spacing, writing more clearly and taking her time. All things that are part of the development of handwriting. Other things that make Alice want to write, fun pens! There is nothing she loves more than a pen that looks like mummy’s and a clipboard. She was brought one for her birthday and she loves it. Just by clipping a piece of paper on it, makes Alice want to write. 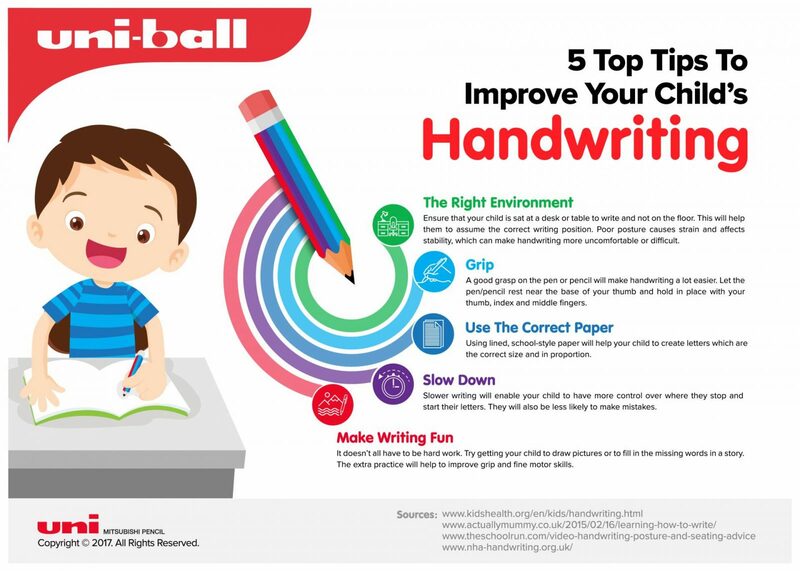 Uni-ball have also put together some helpful handwriting worksheets and when your child is ready a guide for doing joined up writing. 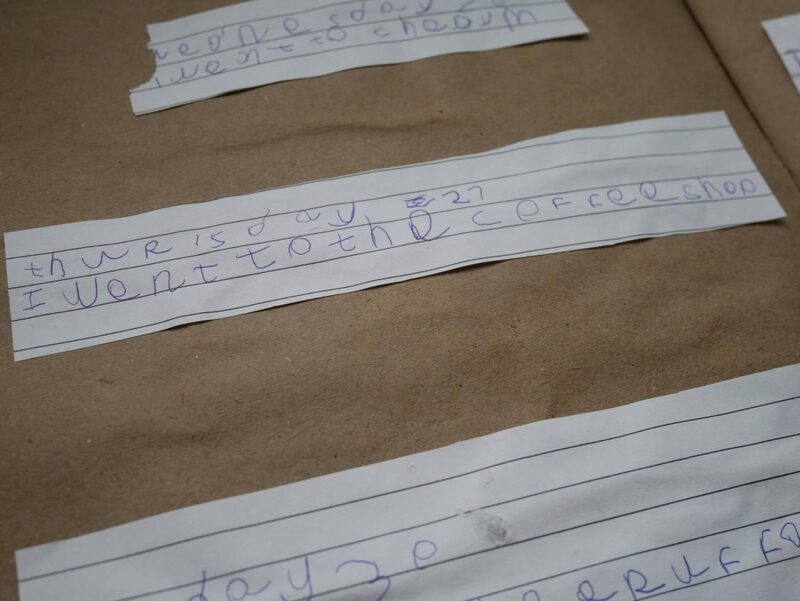 We will be continuing to support Alice with her handwriting and also getting Holly ready for school next year, by going back to basics again starting with her writing her name. Which is always a lovely achievement when they get there! Oh I love the idea of a scrapbook! I might do something similar with Evie, she doesn’t enjoy handwriting practise but does like writing stories, this might be a nice way to get her to put both together! Sounds like you’re a fantastic teacher! Her writing looks great! Nice article. Its so important that children maintain the ability to be able to write. My three year old seems to be deciding on wether she is going to be a righty or a lefty. Love the scrapbook idea! I might get Libby a diary of some description for Christmas, she loves to write and I’m sure it would help her. The uni-ball worksheets are fab. Now we are getting to the age where we are beginning to teach things like writing and telling the time, I realise how much these little people have to take in and learn at a really fast pace. It’s important to support them in every way we can. 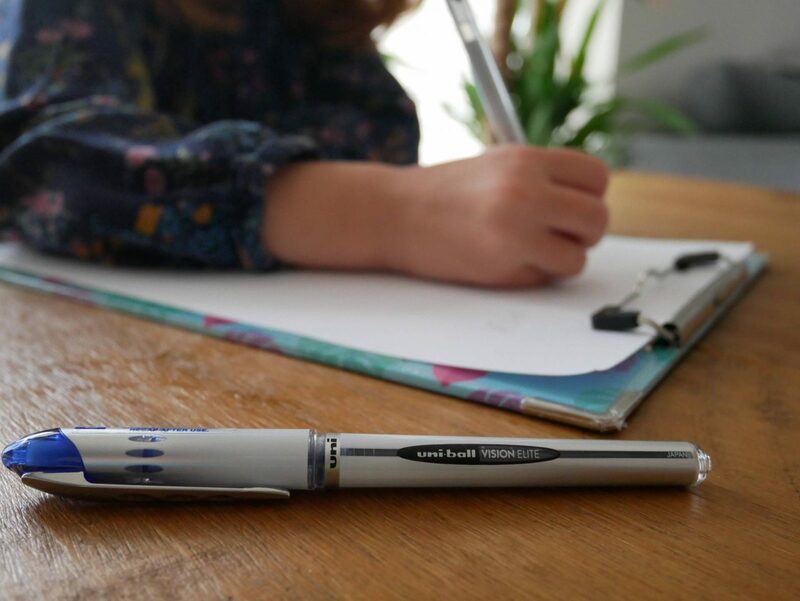 As a teacher I love Uni-ball pens, definitely a brand I would recommend to parents looking to help their children take pride in their work. Mum always gave me scrapbooks used to love them loads, I remember when I qualified for using the pen it was the best time ever.